The additional processing that occurs after the molding operation is finished ensures that the finished part will meet the customer's exact specifications in every regard. 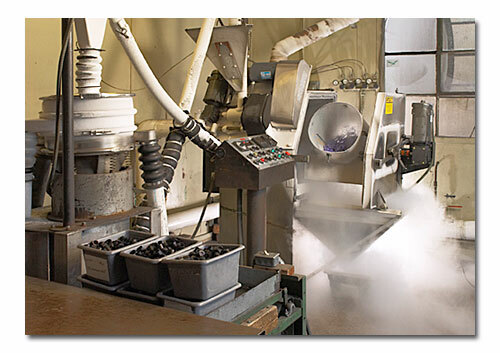 This work is called secondary processing and encompasses cryogenic deflashing, hand trimming, machining, and/or post-curing. Crogenic deflashing in a liquid Nitrogen atmosphere occurs at temperatures as low as - 300° F in a rotating tumbling barrel with plastic media impinging on the parts. It is a rapid, cost effective, and efficient method to remove excess flash that results from the molding operation. Hand trimming is performed to remove excess flash from delicately crafted, intricately shaped, fragile parts that cannot be subjected to the rigors of cryogenic deflashing. It is a labor intensive but necessary step in the production of quality parts that must meet extremely tight tolerances. Machining is performed to remove excess flash from all-rubber and rubber-to-metal bonded parts quickly and efficiently by the utilization of various machines such a bench grinders, lathes, buffers, and drill presses. It is essential that the rubber compound be completely cured (vulcanized) and the physical properties permanently set in the finished part before it is shipped to the customer. Post-curing allows this to occur without disrupting and lengthening the molding process. Some parts are not completely cured in the molding operation because of excessive time needed for complete vulcanization. Those parts are subsequently cured in high temperature ovens for up to 24 hours and then inspected for quality compliance.